“In those Vaikuntha planets there are many forests which are very auspicious. In those forests the trees are wish-fulfilling trees, and in all seasons they are filled with flowers and fruits because everything in the Vaikuntha planets is spiritual and personal. “In the Vaikuntha planets the inhabitants fly in their airplanes, accompanied by their wives and consorts, and eternally sing of the character and activities of the Lord, which are always devoid of all inauspicious qualities. While singing the glories of the Lord, they deride even the presence of the blossoming madhavi flowers, which are fragrant and laden with honey. “When the king of bees hums in a high pitch, singing the glories of the Lord, there is a temporary lull in the noise of the pigeon, the cuckoo, the crane, the cakravaka, the swan, the parrot, the partridge, and the peacock. Such transcendental birds stop their own singing simply to hear the glories of the Lord. “Although flowering plants like the mandara, kunda, kurabaka, utpala, campaka, arna, punnaga, nagakeshara, bakula, lily, and parijata are full of transcendental fragrance, they are still conscious of the austerities performed by Tulasi, for Tulasi is given special preference by the Lord, who garlands Himself with Tulasi leaves. “The inhabitants of Vaikuntha travel in their airplanes made of lapis lazuli, emerald, and gold. Although crowded by their consorts, who have large hips and beautiful smiling faces, the male inhabitants cannot be stimulated to passion by their mirth and beautiful charms. “The ladies in the Vaikuntha planets are as beautiful as the goddess of fortune herself. Such transcendentally beautiful ladies, their hands playing with lotuses and their leg bangles tinkling, are sometimes seen sweeping the marble walls, which are bedecked at intervals with golden borders, in order to receive the grace of the Supreme Personality of Godhead. 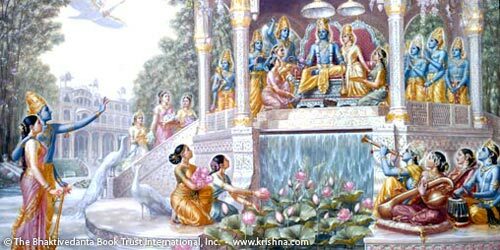 “The goddesses of fortune worship the Lord in their own gardens by offering Tulasi leaves on the coral-paved banks of transcendental reservoirs of water. While offering worship to the Lord, they can see on the water the reflection of their beautiful faces with raised noses, and it appears that they have become more beautiful because of the Lord’s kissing their faces.